Neat, but typically missing pictures from the back. awesome! Because I come to this site to buy stuff and I was worried you were going to try to teach me how to build my own. Whoa, do people really buy these for _$80_!? They are cool, but I’d think that the people most likely to want one are also the ones most likely to want to make them themselves. If these are really hot sellers, I need to get into a new line of work! nothing more then a rip of Mark tilden’s work. Let me attempt to remedy the situation. 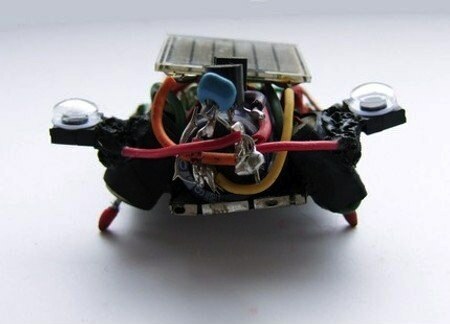 This keeps things cheap, and avoids a lot of trips to parts stores; virtually all the parts required to make a BEAM robot can be found in broken electronics (ovens, walkman’s, CD players, VCRs, pagers…). While less powerful than even a small battery (and, up-front, more expensive), solar cell s last for years; solar-powered BEAMbots don’t require constant battery replacements or down-time for battery recharging. They have a circuit library, thorough explanations for even the most novice of hobbyists, and plenty of links to inspiration. The site is geared well to accept traffic from HAD. It’s all text, and there are even competitions every year all over the world. Backtrack to http://www.solarbotics.net/ for information on techniques, history, coming events, books, beginner how-to, articles, and generally everything that you can’t glean the linked bestiary. I did not see you there spike. Good call.